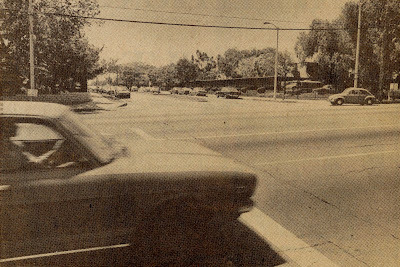 According to a May 13, 1985 article in the Los Angeles Times about the Falk Ranch, Northridge Farms came into existence when the Barbara Stanwyk / Zeppo Marx combine lost interest in horse breeding and "... sold out, lock, stock and barrelt, to J.H. Ryan, prominent sportsman and breeding enthusiast. Ryan changed the name to Northridge Farms, which became one of the state's leadingh breeding centers, boarding as many as 300 horses." 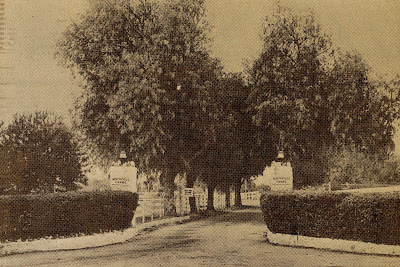 Lawrence K. Ho took this photograph of the entrance to Northrdige Farms before its sale to developers in 1961. (click on image to enlarge) News clipping courtesy of Steve Falk 2011.